If you haven't bought everything on your holiday list yet, you still have time - with free shipping on Free Shipping Day, December 18th. To participate, companies have to offer free shipping with no minimum order. 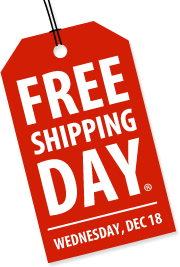 More than 1,000 retailers are expected to sign on for the free shipping day, with gifts guaranteed to arrive in time for Christmas Eve. Some companies participating in the past were:: Toys R Us, Babies R Us, FAO Schwartz, eToys, Baby Universe, Avon, Buy.com, Borders, Footwear Etc., Kmart, Leapfrog, Land of Nod, Macy's, Nordstrom, Petsmart, Ritz Cameras, Sears, Dell, Discover Store, Disney Store, Ebags, Apple Store, American Eagle, and more. For a full list of participating retailers, click here.